Home › Latest News › We welcome Kevin Rendell to the team! We welcome Kevin Rendell to the team! 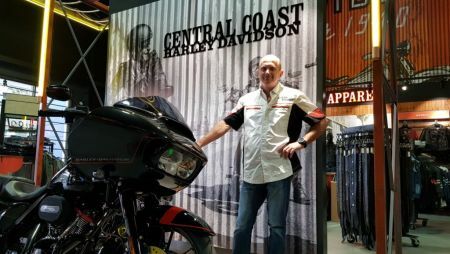 Kevin Rendell has taken on his new role as Dealer Principal here at Central Coast Harley-Davidson®. Having been involved with Harley-Davidson® for over 12 years, it’s not hard to see that Kevin will bring with him so much experience. Kevin has been a rider since he was 12 and in the automotive industry all his life. Kevin’s favourite Harley-Davidson® model (to look at) is the 2012 CVO™ Breakout® and his favorite to ride and tour with is the CVO Street Glide. But Kevin also has his eyes set on a MY18 Tri Glide® Ultra! Drop down to the dealership and check out the renovations, plus meet Kevin!